51 days after Hurricane Maria hit, the people of Puerto Rico continue to remain mostly without... without power, without fresh water, and without adequate relief assistance. A full blown humanitarian crisis has largely been ignored. This continues to floor us and tug at our heartstrings. Operation Puerto Rico Care-Lift provided over $225,000 in relief supplies, over 15 flights and evacuated 500 people from the Northwest part of the island, due to the support of people like you and the amazing partnership with Spirit Airlines. With the holidays approaching, imagine having gone through this horrible devastation and now not being able to provide holiday gifts for your children and family. Imagine how the children will feel who have lost so much, receiving very little in the way of holiday cheer. Together with you, Operation Puerto Rico Care-Lift is going to change that and make a difference once again. We will be raising funds to purchase gifts, toys, books and holiday items for the people of Puerto Rico. We will also be throwing a children's holiday party in Aguadilla. Time is of the essence, we have our first flight in about 10 days for a total of 3 through early December . We have at least 30,000 pounds available to us on the planes, so it’s GO time for a good cause. You stepped up before. We hate to ask after so much generosity, but we need you once again. Our goal is to spread some holiday cheer to an island of people that deserve and need it. Gracias por hacer de estas Navidades unas Navidades felices para Puerto Rico! Sunday’s #OpGiftLiftPR La Gran Fiesta Navidad in Aguadilla, Puerto Rico was BIG Indeed. The only thing bigger were the joyous smiles on the kids’ and parents’ faces reveling in holiday cheer. Far surpassing our expectations, around 5,000 people came from island-wide for the largest toy give-away PR has seen! 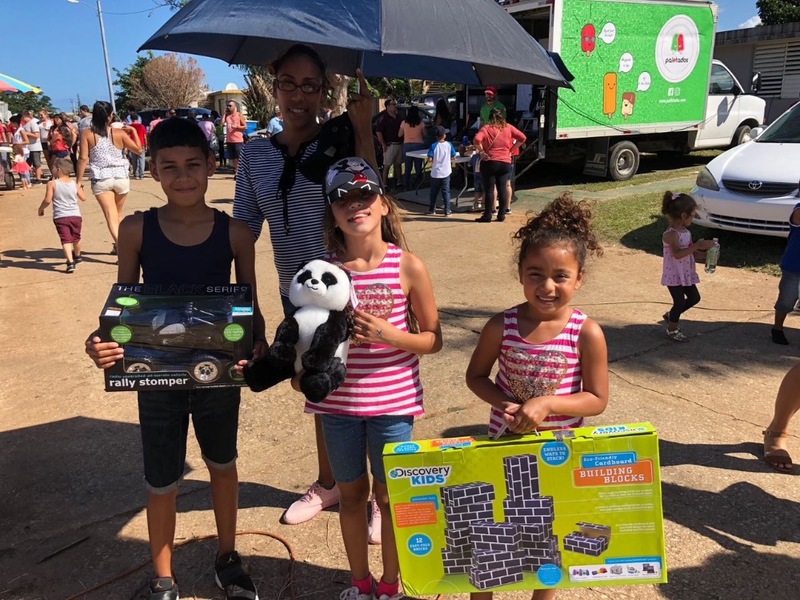 There were bounce houses, live bands, traditional dancers, entertainment, performing clowns, Santas, 3 Kings in costume, 3 giant pig roasts, paella, cotton candy, a mechanical bull, Lego Building tent, Coast Guard flyover, and the list goes on and on - hosted by WAPA-TV Celebrity Talent. The Lines began forming at 7AM - 4 hours before we even opened and the party went on and on past 5pm! People were thrilled and super appreciative. And then in the midst of the party, another Spirit Airlines jet sleigh arrived into Aguadilla with tons of more gifts destined for hospitals, orphanages, and children throughout the island. The Big Toy Giveaway wouldn’t have been possible without your generous donations!!! THANK YOU SO MUCH to our GoFundMe donors. WAPA-TV, Spirit Airlines, Lufthansa Technik PR, WSVN-TV, and our corporate sponsors provided tons and we do mean tons of toys under the aegis of toy czar Malcom Bird. Thank you to the Ramey Committee volunteers who helped organize this event in style! And we feel pretty certain, a little boy named Calder Sloan's energy kicked in a little something extra too! Please check out our Facebook page for tons of pictures and updates. GoFUndMe isn't the best place to distribute photos. Also, Channel 7 out of Miami and WAPA-TV in Puerto Rico both did stories on the event. The link to that video is below. 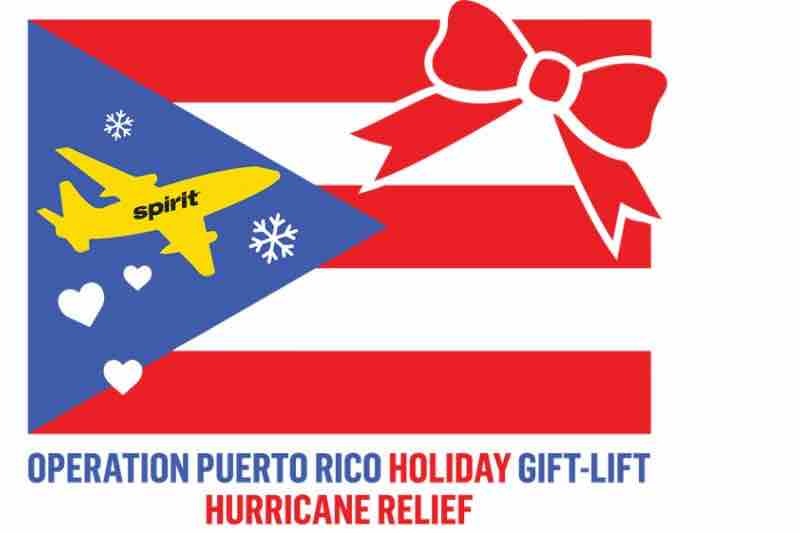 Yesterday, Sunday Nov 26, our 1st of 3 @SpiritAirlines jet powered sleighs traveled to PuertoRico. Thanks to all you Santas & Hanukkah Harrys, this flight was packed to the brim with 7 tons of your donated toys & gifts. 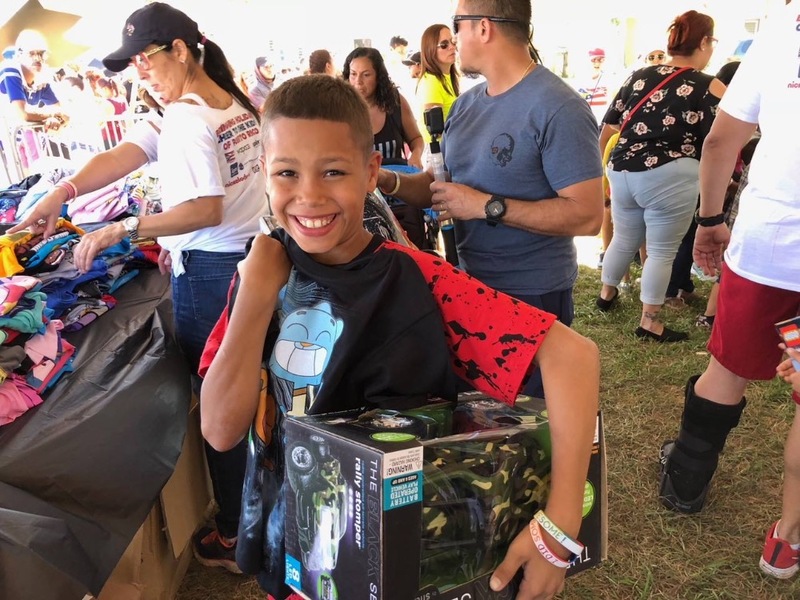 Even during our very short time on the island, The OpPRGiftLift team of Chris and Carla Sloan were greeted with such overwhelming gratitude and anticipation for not forgetting our Puerto Rican brothers and sisters for this holiday season. One teared up worker hugged them and said “It’s a Christmas Miracle”. Special Thanks to Jonathan Morales Vera at Lufthansa Technik PR and his team for handling storage and inventory on the ground. We'll be sharing gifts with their family and inviting them to the Kids Carnival too. 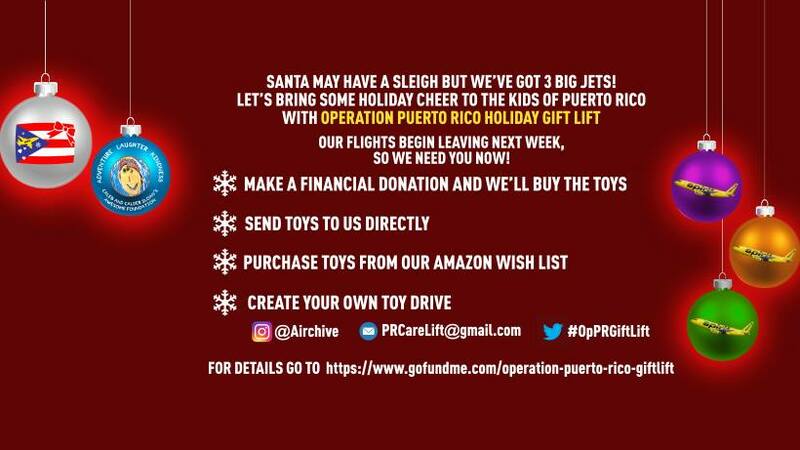 We have another 2 weeks of gift collecting, toy drives, & fund raising until our final flight and big holiday family fiesta in Aguadilla. 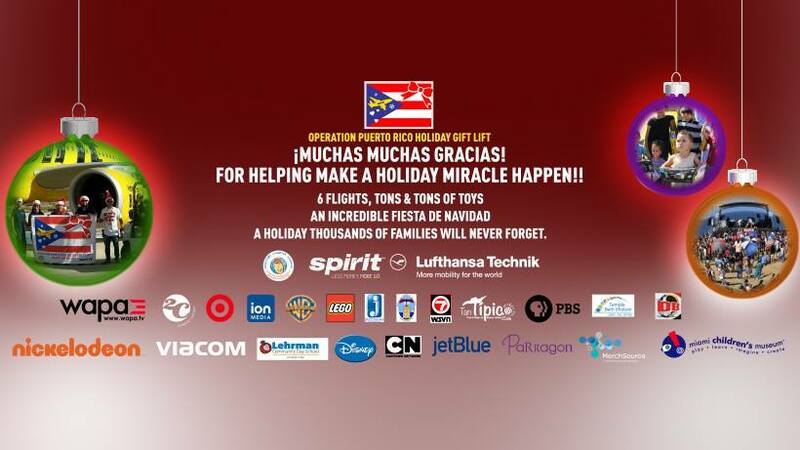 Let’s fill those planes and those hearts of our fellow Americans in the Caribbean so they can have a Feliz Navidad. We want to thank all of you who are making this possible with your generous donations. Some larger corporations have stepped up with some significant donations as well. Thank you so much to ION Media, Bravo TV, Taylor Guitars, Miami Children's Museum, JazWares, Viacom, Parragon, MerchSource and PBS. Of course a HUGE thanks to Barb and the folks at Spirit Airlines for making all this happen. Please visit our facebook page for updates...and thank you for you donations here on GoFundMe. We appreciate you sharing this with others. 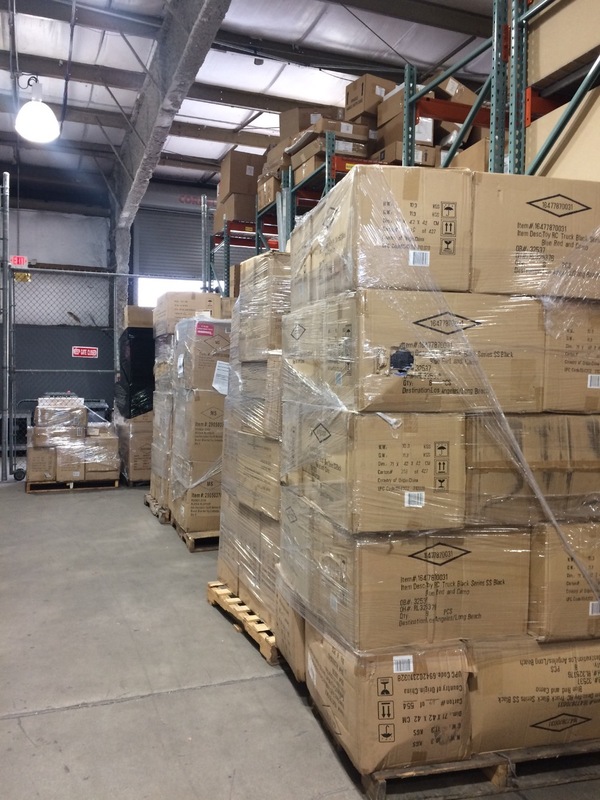 20,000 children's books are boxed and being loaded onto our HOLIDAY Spirit GIFT-Lift plane and headed to Aguadilla, Puerto Rico this FRIDAY! Amy and her team at Parragon Publishing stepped right up with this massive donation. THANK YOU!! THANK YOU!! 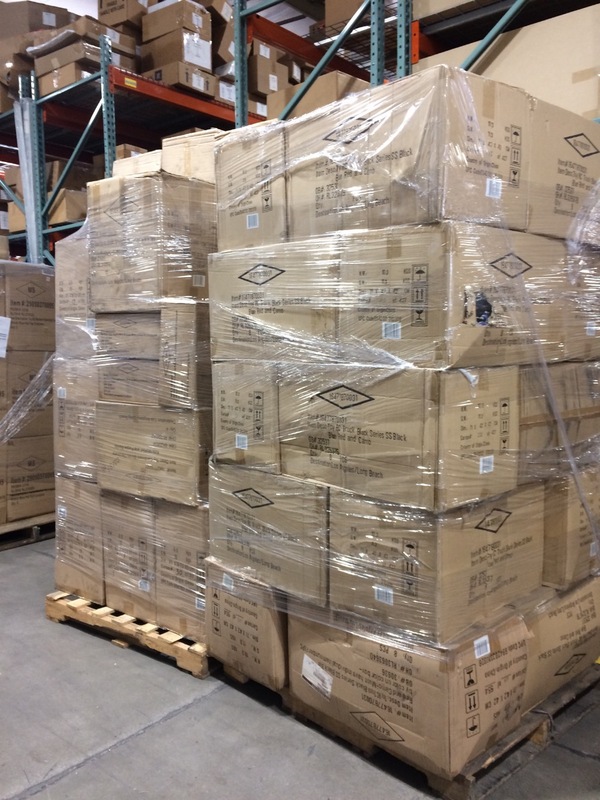 $40,000 worth of toys, games and kid stuff donated by Adam and MerchSource are boxed and ready to go. These are going to go a long way towards spreading some holiday cheer on the island of Puerto Rico. So GRATEFUL and THANKFUL for these donations. We are in a big push as two of our three planes leave in the next few days. Please continue to share our GoFundMe page and also visit our Facebook @operationpuertoricocarelift page for more updates.